Very little happens in Fold. Apart from a few games of poker amongst a group of male friends. 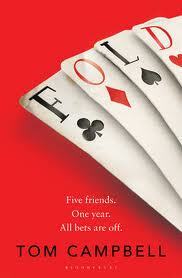 But Fold - so tightly written it squeaks - is a compelling observation of modern manners and rivalries amongst men. Nick is an odious narcissist with only one interest: himself. All the more surprising considering his lack of success in life. Frustrated by his futile existence, he decides to dedicate his time to bringing down fellow poker player Doug to his level. Vijay is an accountant, whose comfortable life is augmented with the number-driven excitement of poker. Alan is a computer programmer with a fatal lack of confidence. But don't write him off: anyone can transform their life. Simon is philosopher and academic with a penchant for fine wine. His lack of academic success is mitigated by prowess at the card table. And then there is Doug. The arrogant, pompous - and wildly successful - Doug. Bane of Nick's life and he-who-regularly-cleans-everyone-out-at-cards. The story deftly switches from one first-person narrative to another, like a 'word-cam' strapped to each man's head. Using flashbacks and internal monologues, Campbell builds each character, teasing out their foibles, neuroses, hopes and dreams, game by game. The lack of action is what makes this book a triumph. Because life is like that, isn't it? Often, nothing much happens at all. But we hope, we dream, we scheme, and we play. Fold, check, call or raise. Here's the trailer for the book by publisher Bloomsbury. Footnote: I can't help wondering how much of this reflects the life and times of Tom Campbell. It's tempting to project elements of each character on to the author. Doubly so when you've met him. Tom recently provided consultancy work for my employer, Skillset. He'll have to tell me next time he's in the office.